If you’re a resident of California, here’s a way to save money and earn AAdvantage Miles: become a member of the Alaska Airlines frequent flyer program. For a limited time, receive a $50 Discount Code when you sign up for our award-winning Mileage Plan loyalty program. There’s no cost to join, so what are you waiting for? Let Alaska Airlines and Mileage Plan help you discover your next favorite destination. From Anchorage to Zihuatenejo, Honolulu to Boston, and numerous places in between…now is the perfect time to explore all of the great places that Alaska Airlines flies. With Mileage Plan, you’ll earn miles every time you fly Alaska Airlines or any one of our airline partners. With our numerous partnerships, there are hundreds of ways to earn miles without ever leaving the ground. Watch your account balance grow simply by doing things you normally do, like eating out, ordering flowers, or shopping. Be sure to enter your Mileage Plan number each time you make a flight, hotel, or car reservation. Your miles will add up in no time and you’ll be on your way to earning award travel to any number of destinations around the world. The $50 Discount Code sign-up offer is valid for new Mileage Plan member sign-ups only. Must be a resident of California to qualify. Offer is valid for sign-ups through October 26, 2012. Please allow 48 hours for Discount Code to be issued. Discount Code Terms: Valid for new ticket purchases only at alaskaair.com. One person per Discount Code. The recipient of the discount code must be the traveler. Discount Code is valid for $50 off a minimum $100 fare (before taxes). Discount Code is valid for travel between September 5, 2012, and November 10, 2012. Discount Code may be used for travel departing from California to any Alaska Airlines city (Prudhoe Bay excluded). Earn miles when flying on Alaska Airlines marketed and operated flights for travel on an eligible published fare ticket. Miles are also earned on Alaska Airlines codeshare flights operated by American Airlines. Travel on Alaska Airlines and affiliate airlines counts toward qualifying for AAdvantage elite status membership. Another benefit of American’s alliance with Alaska Airlines is that AAdvantage elite status members can enjoy benefits, including priority check-in and boarding, express security lanes, preferred seating and waived checked baggage fees, when flying on Alaska Airlines. One exception: if you’re traveling on an Alaska Airlines numbered flight operated by American, you won’t be able to use your AA elite status. Not sure why that is, but I was able to select preferred seats on Alaska numbered and operated flights, but when I tried to select a preferred seat on a SFO to JFK Alaska Airlines flight operated by American, the website wouldn’t allow it. There’s a thread on Flyertalk that seems to confirm this. Anyway, I came across this offer while reading ChrisK’s blog Traveling To…, so if you’re interested the Alaska Airlines offer, go visit his site for the signup link. 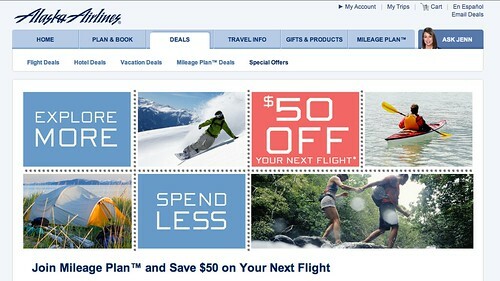 Speaking of other blogs….don’t forget that the Frugal Travel Guy’s Monday Deal of the Day is sponsored by AAdvantage. Go here to share you favorite AAdvantage or AA related travel tip for a chance to win 2,500 AAdvantage Miles!